So far, I know I need the whole R6 nose, and an yzf tank, and r6 tail. 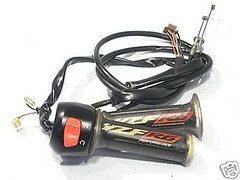 I am also wanting to go with r6 gauges. So the Bike is stripped down, I'm starting on the Nose first. Couple of questions on the nose though. Does anyone have a good how-to on this? I know I need a 3/8 spacer, and smaller bolts. I think I am going to have an issue with the brake reservoir hitting the fairing bracket, Should I just go with a r6 brake reservoir? Or is there one that will work better? I won A complete r6 key set on ebay, so I hope the r6 gas cap will fit the yzf tank. 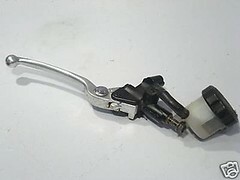 My ignition got screwed up in the accident, and I was thinking about replacing it with a r6 ignition, because I will be doing the yzf tank swap, will a r6 ignition work? Last edited by Genesis on Tue Jul 29, 2014 9:34 pm, edited 14 times in total. Take lots of pics. We have an excellent GALLERY! Freeze should be able to help with the nose conversion. I know he did a different year/model, but the practical knowledge he's gained from doing his should help. Unfortunatly from what I understand, the R6 gas cap will not work as it is a different size nor will the ignition switch. Might be able to get the switch to work though, but I don't think it will be easy. Could be wrong though. I do know that the YZF series have always had 4 wires coming from the switch and I don't know what the extra one is for. 95FZR600 did a R6 gauge conversion so he should be able to help there. Get posting pictures guys. And the best How-To will surely be in the next running for some donated item like the Plastex. Hard for us knuckleheads to visualize what you're saying without pictures.
" several meat-eaters lay in vomit, too weak to move..."
will the r6 clampons fit the FZR forks or will I have to put some sort of bushing around the tubes? R6 Clip-ons will not fit, but Vortex makes aftermarket ones that do. You need 38mm. An R6 brake upgrade might help with the fairing issue as well since it uses a remote resivour. 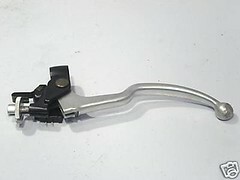 can I mod the stock clmapons to except the r6 levers and switches/controls? I love search, lead me right to it. I have a 05 R6 nose and I have encountered a whole slew of problems along the way and still havent finished due to some of them. If youre trying to mate the R6 nose to FZR fairings one big problem is that my R6 nose is horizontal on the bottom edge. The top of the FZR fairings are not horizontal so it leaves a triangular gap. I have fiberglass fairings and can pretty easily add to it to fill it in I just need to get it done. If youre going to use R6 side fairings too it may be easier to adapt them to fit. I havent tried that route. The nose mount needs several things for mounting to the frame, at least my 05 piece did. First, the mounting tabs on the frame are off center and angled inward a bit. The r6 mount is straight on, not angled, so I had to grind the frame holes to make a surface parallel to the centerline of the frame. On the 05, the distance between the mounting holes is different on the FZR and R6, so the mount wont line up. But there is also about a 3/4" gap from the frame side mount and the nose mount in the position when its centered. I took a solid piece of aluminum and made an adapter. There is precious little space for guages and I cant use my fancy expensive aftermarket tach now because it wont fit. The R6 guages are very thin, so there just isnt much space if you dont use them. 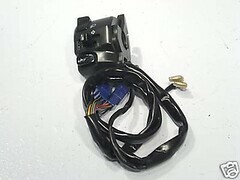 Im running a R1 master cylinder and its close. I am starting to consider the idea of going to those guages, but I still dont think I could get the speedo working, I need to look into this more. To put the R6 controls on, go with thatkids writeup. The clutch perch will bolt right up to stock clipons, but the clipons do not interchange. Im running a R6 perch so I could run R6 levers. I think I have have just now decided on changing my guages. I think R1 guages and a speedo healer and Im set and Ill have much more room and will actually funtion a bit better for me. Im going to use R1 instead of R6 since the R6 is a much higher revving bike and the R1 redline is almost the same as the FZR, the tach matches up better and you dont have to guess at a glance.